How and when did you first start running? All of this can be blamed on fellow NVRR member James Braddon who took me to fountains Abbey Parkrun a few years ago. I remember I ran 27:27 and this was 4 months after major surgery. I have new completed over 50 parkruns and hoping to reach 100 sometime next year. What brought you to Nidd Valley? Every weekend I would be taking part in some running event and every time NVRR had a huge presence and would cheer me on even though I wasn’t a member. I was being pursued by 3 other running clubs at the time. Having friends already in the club meant I would hang around with them and I could see straight away this was the club to join. What is your favourite running music? Genre or specific tracks? I don’t listen to music when I run. What is your favourite food before and after running? The only time I pay attention to nutrition is for marathons and ultras. I tend to have rice pudding in the morning and some cake just before the start of the run. Afterwards I take on recovery shakes and salt and vinegar Pringles. What is your best running tip that you would like to share with us? Never doubt yourself and your abilities. Always back yourself. Foam roll everyday. What is your proudest moment in your running career? I have far too many to choose from. Coming 2nd in a 20 mile event. 3rd in a 5K trail race and competing in the Hardmoors 55 in the Beast From The East to name a few. What event are you training for at the moment? The Hardmoors Super Slam next year which consists of a 30 mile ultra on New Years Day. A 50 mile ultra in March. 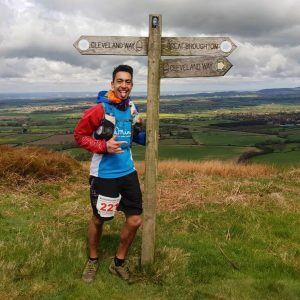 110 mile ultra in May. 60 miler in September and finally an 80 miler in November.